One week only. BIG savings on bee pollen, The Miracle Cream, Royal Jelly capsules and more! Welcome to another edition of The Buzz! I've got some Hot, Summer Savings for you with great sale prices on several of our most popular products! But I can only offer these discounted prices for one week. The sale ends at midnight on Tuesday, June 14th. So please take advantage of these great prices before time runs out! Our best value bee pollen just got better! Normally $59.99, now on sale for $54.99. If you take a tablespoon a day, this size has 166 servings. Perfect for families and those with pets. 4. Our bee pollen is air dried and quickly packaged for maximum freshness! Click here to view this product at its special price in our online store. The Miracle Cream continues to make miracles! Your feedback assures me of this! Our regular price is $34.99 for our 250 ml bottle....save $4.00 right now! Sale price of $30.99. 4. Use with bee pollen and GLA Skin Oil for radiant skin! The GLA Skin Oil has quickly become one of our most popular products! A very special Omega oil, GLA is vital for glowing, healthy skin! Regular price is $32.79. On sale now for $29.79! 5. Use with The Miracle Cream and Bee Pollen for radiant, glowing skin! Our extra potent royal jelly capsules are 100% North American sourced. They pack twice the punch of regular royal jelly supplements so you get twice the value! Our 120 cap bottle is regularly $43.99. Save $5.00 right now! On sale for $38.99. Recent studies having validated propolis' activity against cancer, inflammation, allergies, viruses and asthma! Regular price of $37.49. On sale now for $33.49! Beautiful hair starts within. This is one of my favorite products. Your friends will notice and ask you for your secret! 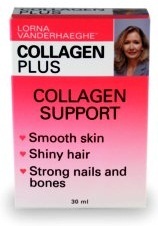 Collagen Plus will also help keep your bones strong! Regular price of $35.99. Sale price of $31.99. 4. Can be used with bee pollen for even healthier, stronger hair and nails!